CANBERRA—As populations and food needs grow across the Middle East, one Egyptian businessman has spotted a niche export opportunity for Australia: camel meat. Magdy el Ashram, who has spent the past two years in Australia, is reaching the final stages of a plan that he believes could both feed a hungry region and resolve one of Australia’s biggest feral-animal problems. Mr. Ashram last week applied to the government of the South Australian town of Port Pirie for permission to build a plant to slaughter up to 100,000 camels annually. It would be the first industrial-scale attempt to process the meat in Australia in accordance with halal dietary laws that make it suitable for Muslims to eat. Camels, prized in the Middle East for their fat-rich milk and lean meat as well as a means of transport, are a pest in Australia, blamed for devastating wilderness and farmland. Introduced in the first half of the 19th century as pack animals to help open up the country’s vast interior to European settlers, they now roam in numbers that exceed a million, the government estimates—about 10% of the world total. Facing forecasts that if left unchecked the population could double in the next decade, the federal authorities in 2009 set up a four-year, 19 million Australian dollar (US$20 million) project to cull the animals. In Mr. Ashram’s vision, cuts of camel will join kangaroo steaks and crocodile fillets in a small but growing niche at the exotic-meat end of Australia’s A$30 billion agricultural export industry. The country annually exports about 14,000 tons of kangaroo meat, worth an estimated A$27 million. 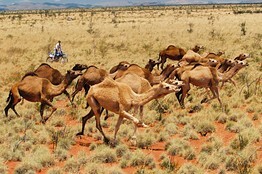 “The project stacks up on virtually every front and I will take a hands-on role in ensuring its success,” said Michael O’Brien, minister for agriculture & fisheries of the state of South Australia, who describes feral camels as an environmental menace in his state, which is bigger than Texas but has a population of just two million people. He said he’ll lobby intensely for the project. But Mr. Ashram says he has built up a reliable network of suppliers since he set up his meat-export company, Magdiens Australia, a couple of years ago. (It currently ships frozen beef and lamb to Egypt.) His plan: to pay local Aboriginal communities to track and capture the animals. Once captured in the bush, the camels will be trucked back to Port Pirie, where they’ll be slaughtered in adherence with strict Muslim guidelines. The camel meat will then be frozen and sent 110 miles south to Port Adelaide for export. “I’m not anticipating too many problems,” said Martyn England, director of major projects at the state’s Department of Primary Industries & Resources, which has assessed Mr. Ashram’s plan. “The quality of the camel here is recognized in the Middle East as being some of the best in the world,” said Blair Brice, an official at Australian industry marketing group Meat & Livestock Australia Ltd., who previously worked as a representative in the industry body’s Persian Gulf office in Bahrain. And that can mean big money: In the busy markets of cities such as Dubai, the meat from the best young camels can fetch up to 70 dirhams (US$19) a kilogram, said Ali Al Hammadi, head of the slaughterhouse department at Dubai Municipality. Camel meat is appearing on more menus in Middle East urban centers. Nestled on Dubai’s creek in the bustling Bur Dubai district, the six-year-old Local House Coffee Shop & Restaurant doles out 150 camel burgers a day to customers who travel from as far away as Abu Dhabi, about 80 miles along the coast, according to Ramesh Elaveetil, the eatery’s manager and marketing consultant. It also serves camel ribs, camel steak and camel soup. Rising meat costs have pushed the price of a camel burger to about $13, from $10 last year, said Mr. Elaveetil. “We are getting a lot of franchising inquiries, and we are thinking of opening a branch in Abu Dhabi as well,” he said. Mr. Ashram hopes that success in the export of camel meat from Australia, not just to the Middle East but also to Muslim customers in the U.S. and Europe, could spur demand for the export of camel milk, which has had a revival across the Middle East—in its liquid form and also in chocolate and ice cream. “That is one of my dreams,” he said. Australia is already big supplier of meat to the Middle East. Last year, the region accounted for 31% of Australia’s global lamb and mutton exports by volume, with Saudi Arabia, the United Arab Emirates and Jordan amongst the biggest markets, according to the Department of Agriculture. Much of the Middle East is arid and unsuitable for agriculture, forcing governments to import basic food commodities. Regional investors have tried to close the food gap by buying land in places like Sudan and Pakistan on which to produce food for shipping back home, but rising prices have added to political tensions that have toppled regimes in Egypt and Tunisia and caused serious unrest in Bahrain and Yemen. —Leila Hatoum in Dubai and Andrew Critchlow in Sydney contributed to this article.